Cooking up the perfect brand identity. Relevance and simplicity, two specialties of the house. 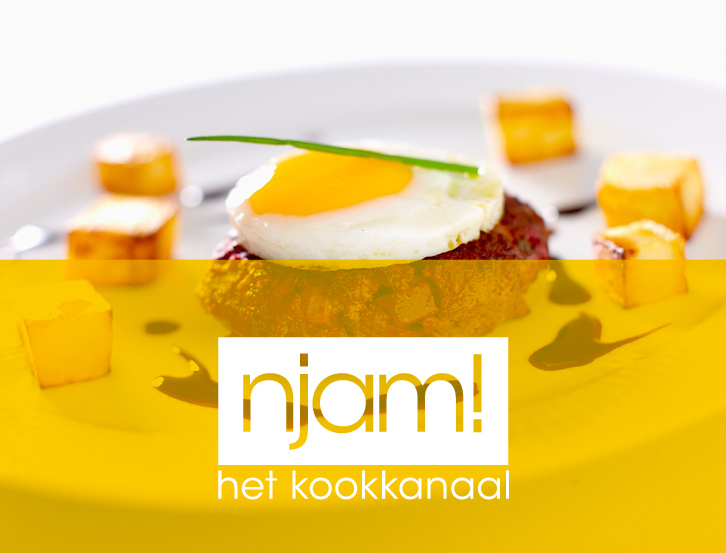 When Studio 100 was about to launch cooking channel Njam!, they stopped by for tea at Seven: “Can you cook us up a new, recognisable brand identity that is flexible enough to implement… practically anywhere? A briefing that was bound to wet our appetite! 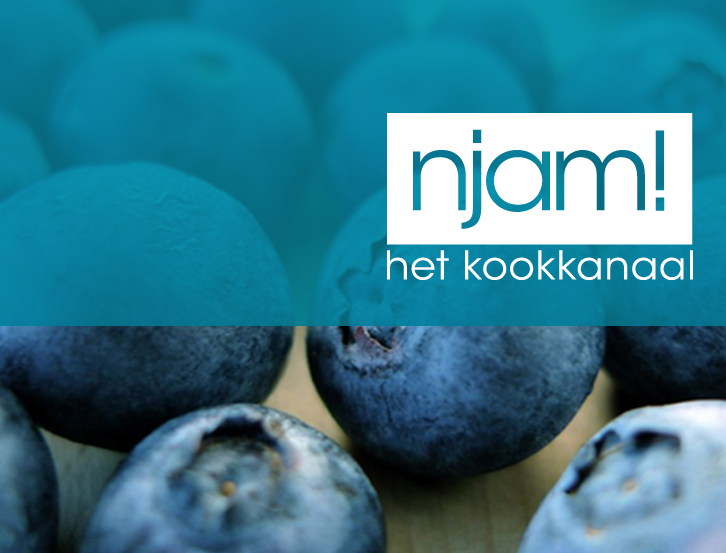 Creating the Njam!-identity was a balancing act. 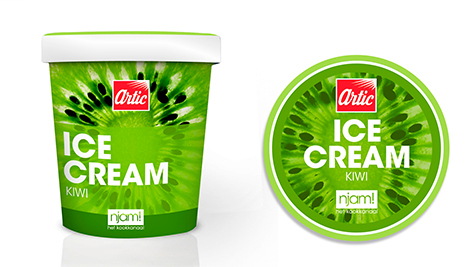 On one hand, we had to be distinctive and tell a lot: Njam! 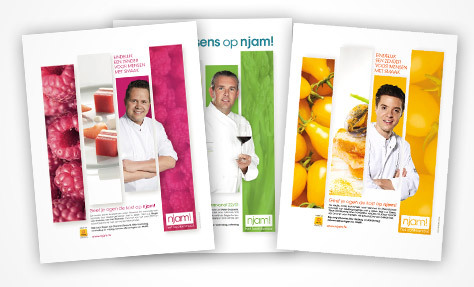 was the first Flemish food channel, and it was working together with superstar chefs. On the other hand, the look had to be very simple and clear so it could be implemented anywhere, whatever the message or the audience. We decided to build the look from simple elements: transparency, colour, and tasty images of fresh ingredients and stunningly dressed plates. These basic building blocks provided an infinite amount of possibilities. Whether it was a specific recipe, a star chef, a tv show or a cookbook they wanted to highlight: it was all possible, on any imaginable media channel. 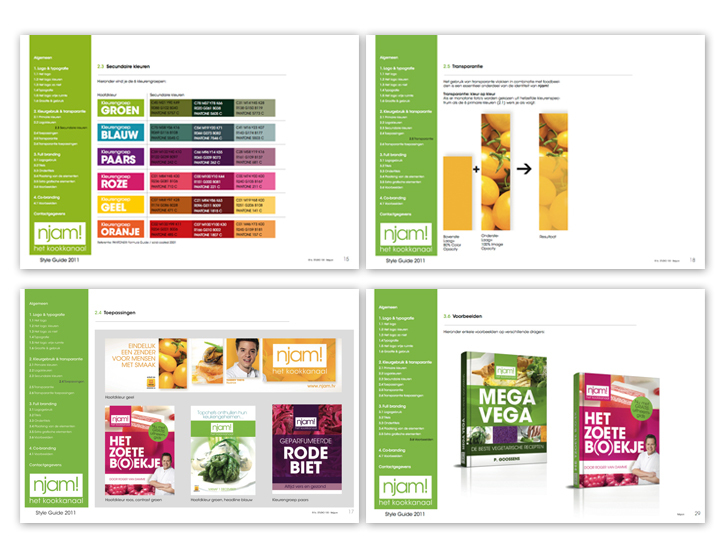 We selected 6 basic colours and white, covering different food groups and offering flexibility at the same time. Some examples: blue for ice cream packaging, pink for a cookbook with desserts, green for a fresh salad, etc. Colour enables you to set an entire mood. From ‘classy chique’ to ‘playfully young’, from ‘summery fresh’ to ‘wintery cosy’. 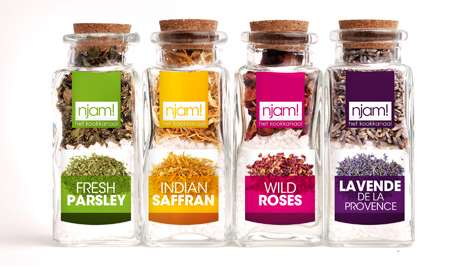 Our colour codes gave Njam all the tools to play on differing seasons and audiences. All-in-one brandbook, a great tool for everyone! Once the creative process came to an end, we started centralising the result in a convenient brand book for internal ánd external use. 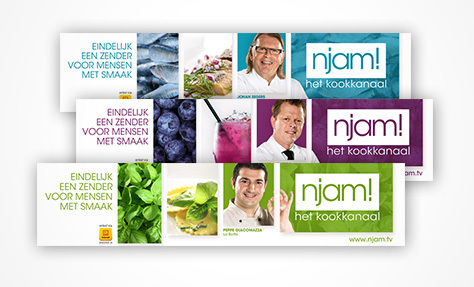 This facilitates external partners (big food brands, magazines etc) to work with the Njam! brand and safeguards its consistency. Njam! brings the greatest chefs together on the same cooking channel. Most of these chefs are pretty famous and awarded with culinary honours and stars. We decided to leverage this potential in the communication. In a follow-up phase we took the tv idents one step further. Njam! wants to bring cooking within everyone’s reach. And that’s what it is, with the right knowledge. So that’s why we wanted to use the tv idents to teach the audience – or at least inspire them. That way, you don’t just tell what your branding is about, you also prove it right away.